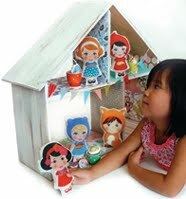 Head on over to Bloesem Kids this week to win a set of all 5 Sweetie Petites sewing kits. The giveaway is open for a week. If you aren't familiar with Bloesem Kids stop by for a while, it's a lovely blog full of fab finds for little ones.